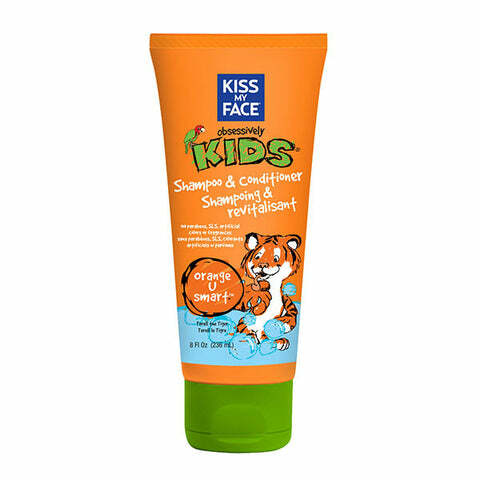 Kiss my Face Orange U Smart 2 In 1 Shampoo & Conditioner 236 ml is a gentle and effective 2 in 1 Shampoo/Conditioner for kids hair. Aqua, Cocamidopropyl Betaine, Decyl Glucoside, Vegetable Glycerin, Aloe Barbadensis (Aloe Vera) Leaf Juice*, Camellia Sinensis (Green Tea) Leaf Extract*, Salvia Officinalis (Sage) Leaf Extract, Chamomilla Recutita (Matricaria) Flower Extract, Punica Granatum (Pomegranate) Extract, Hydrolyzed Wheat Protein, Panthenol (Vitamin B5), Xanthan Gum, Citrus Aurantium Dulcis (Orange) Peel Oil, Citric Acid, Potassium Sorbate, Polysorbate 20 *Organic. Kiss My Face is no newcomer to the green marketplace. KISS was founded by Bob Macleod and Steve Byckiewicz 30 years ago on a 200 acre farm in New York's beautiful Hudson River Valley. It was the dawn of the 1980's. A couple of (very) young vegetarians are living happily in an ancient house on an organic farm that was used as a hospital during the Revolutionary war. One night in front of a crackling fire, a light goes off and the two modestly decide to revolutionize the cosmetic industry. Lofty plans with loads of creativity and style are created. The Kiss My Face natural body care company is born, starting with some big, ugly, green bars of soap from Greece. But there is absolutely no money...the stage is set for a business disaster. The boys load the soap and some organic squash from their garden into their aging VW and head to NYC, all the way hoping the proverbial door won't be slammed in their faces...it isn't! Retailers offer overwhelming support, think the olive soaps are beautiful, buy the squash and even buy them lunch occasionally. The boys are smiling. They were pioneers in the natural space, trailblazing a path for others to follow. Fast forward to today, the boys traded in their VW for a hybrid. There are dozens, instead of a handful, of brands in the natural space. However, Kiss My Face has become a respected leader in natural body care with over 100 naturally effective bath and body products sold in over 19 countries worldwide. And since our products are consistently better, you can feel confident about using them. We've gotcha covered from head to toe ... with a few stops in between.